Every year over a thousand volunteers give their time and skills to serve on board our hospital ship, the Africa Mercy. The Africa Mercy is home for professionals who are offering a wide range of skills: surgeons, dentists, nurses, cooks, electricians, housekeepers, plumbers, bakers, receptionists, stewards and many more! You can discover a few of their testimonies on this page! 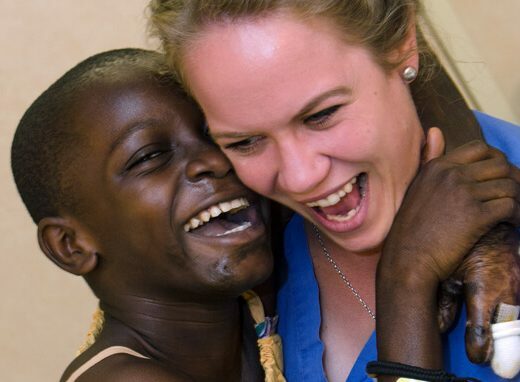 Mercy Ships provides a wide range of opportunities for those who wish to serve in both the medical and non-medical fields. We are looking for qualified professionals, young adults, retirees, any person who is willing to participate in the work of Mercy Ships. We are looking for craftsmen for the maintenance of our ship in June and Juli. Learn more in this PDF. Open a registration account, fill in and send the registration form. - You must be a minimum of 18 years old and have good knowledge of English. - We do not offer internships for medical students. We focus on the training of local personnel. 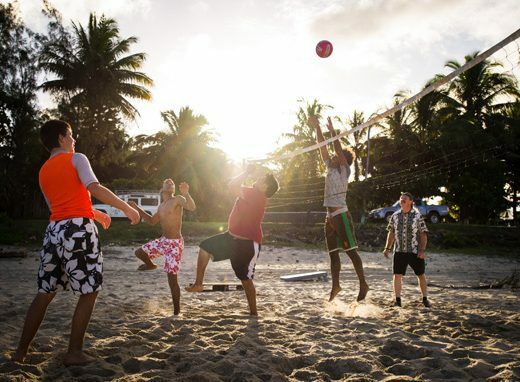 - The costs of flights and accommodation on the ships are to be borne by the volunteer. - The ship is visiting ports in West and Central Africa. - The ship stays about 10 months (September to June) in a country and undergoes a technical phase of two months (July & August), in general in the Canary Islands. 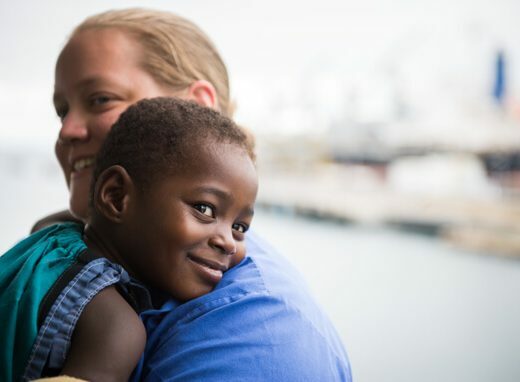 Mercy Ships is a Christian organisation and a significant section of our crew members are believers. 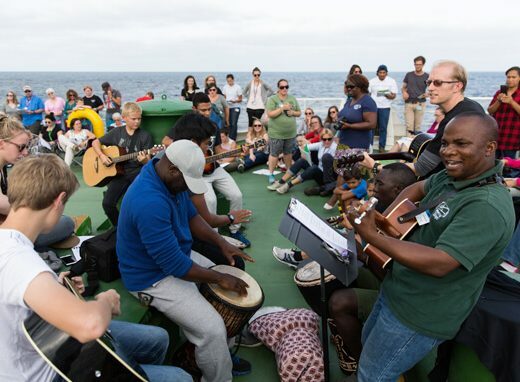 Yet everyone, regardless of their origin and religion, is welcome on board, as long as they have Mercy Ships' mission at heart, accept Mercy Ships' core values and have the necessary skills. For long missions, adherence to the Christian faith can help with feeling comfortable among the on-board community. 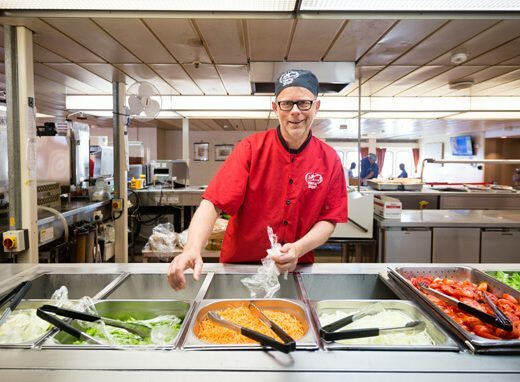 When you work aboard a Mercy Ships hospital ship, you also live there. You will share your new home with around 400 volunteers ! On board, there are a limited number of cabins for families and married couples. 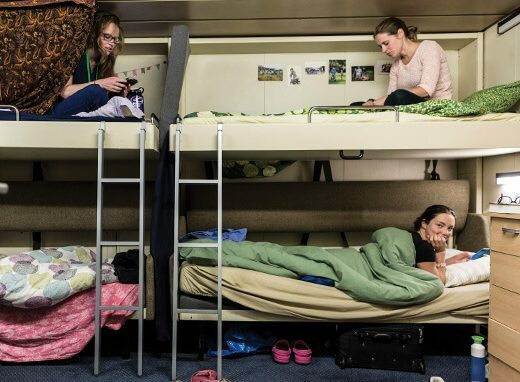 Single people share a cabin with between 3 and 10 people. The allocation of cabins depends on your position on board and the length of your stay. Most cabins are equipped with a bunk bed, a small shower room, a desk and a wardrobe. On a ship, personal space is obviously limited. But living in community for a while is a great experience ! On board, three meals are served each day at specific times. The kitchen team takes up the challenge of preparing nearly 600 servings per meal. You can have a coffee in our Starbucks with your new colleagues and friends. The coffee area also has a snack bar and a shop. The on-board community works like a village and everything is planned so that you have all that you need. The ship is equipped with a self-service laundromat, a small hairdressing salon, a bank, a library, various lounge areas, a school for the children of volunteers, and even a medical clinic especially for the crew. Wifi is available throughout, including in your cabin. However, the quality of the wifi is variable, depending on the location of the ship. Whatever else, these weeks / months of engagement will be an unforgettable adventure for you. The friendships that are born on board are remarkable. You will have the opportunity to leave the ship to explore the city and its surroundings, go to the beach, the market or participate in a 'Mercy Ministry' when you can visit an orphanage or a prison. Contact with the local population adds an extra dimension to this unique and unforgettable experience. 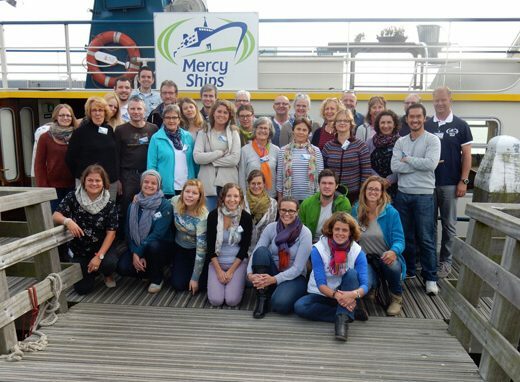 To learn more about Mercy Ships and life aboard the ship, the Mercy Ships Introductory Course (IMS) offers a 3-day program over a long weekend (usually April and October), on a barge in the Netherlands. Topics include an introduction to Mercy Ships, transitioning, questions about community life, fundraising tips and an interview. All courses are given in English. If you would like to receive further information on the IMS course, or to register, do not hesitate to contact us! If you wish to work on board, there is an online application process. Once completed, you will be put in contact with our human resources department, located at our operational center in the United States. All applications are in English. For most jobs, no interview will be given. In order to get to know you a little better, we ask for references from people who know you well and with whom you work. The forms are found on the online application. In addition, because you will be considered a crew member, you will be subject to maritime law. This will involve various codes and regulations to sign on board and it is also for this reason that a medical form must be completed by your doctor to vouch for your good health. Our Swiss office is at your disposal at all times before, during or after your application to assist you or answer your questions. What is the level of English required? It is imperative to have a good knowledge of English in order to understand the other crew members and to be able to express yourself. Additionally, the maritime laws to which we are subject demand it for safety reasons. English will probably be the only language you will use throughout the duration of your engagement, during both work and leisure times. In addition, a sufficient level of understanding is necessary to help you relate to other people. It will also contribute to ensuring that your work on board is pleasurable and that your stay on the ship is a success for you. What is the minimum commitment period? The minimum length of commitment varies according to your position. For some medical positions (surgeons, anesthetists, OR nurse, dentists and others), it is 2 weeks. For all other positions, the minimum varies between 2, 3, 6, 12, 24 or 36 months. Generally speaking, people who wish to commit for a longer duration are given a higher priority. 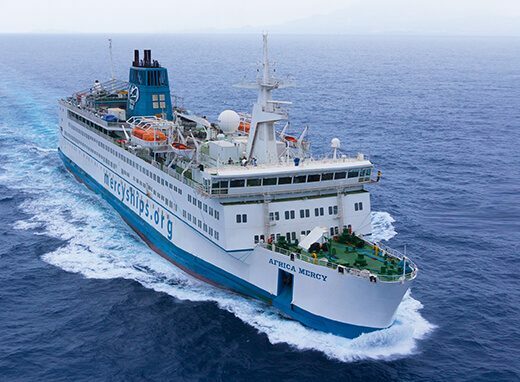 Can I do my civilian service on board the Africa Mercy? Unfortunately not. Due to the requirements of the Central Office for Civilian Service we cannot offer internships for civilian service on board the Africa Mercy. Will I have contact with the local population and / or patients on board? Outside of your working hours, you can, of course, leave the ship and go out to meet people. Visits to orphanages and prisons are regularly organized and you just have to register. If you do not work in the medical field, you will also have the opportunity to visit the patients of the ship's hospital and make contact with them!